Cheese straws are one of those delicious snacks which many people can’t resist. They go down well at every occasion – be it at a drinks party or picnic. They are best eaten straight out of the oven, however, they can be made in advance and stored in an airtight container to keep them crisp for 2 days. Follow Nathan Outlaw’s instructions below for simple shortcrust pastry straws flavoured with cheddar. The cheese used is usually cheddar but Parmesan, Gruyère or Emmental can also be used. 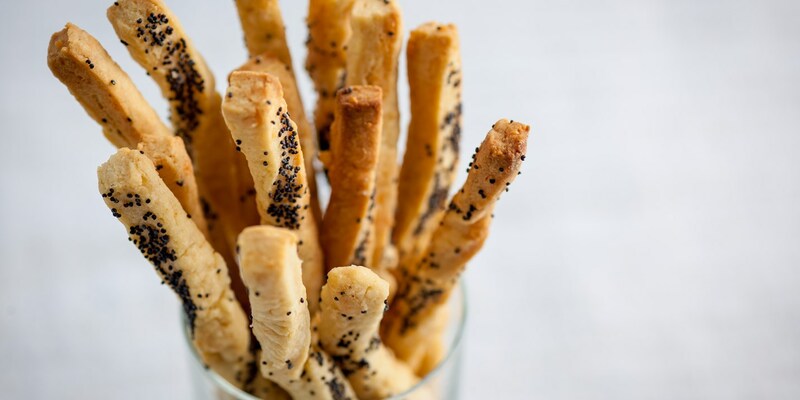 To add a little extra flavour and texture, after you have egg-washed the straws, sprinkle over some poppy seeds, paprika or some toasted fennel seeds.